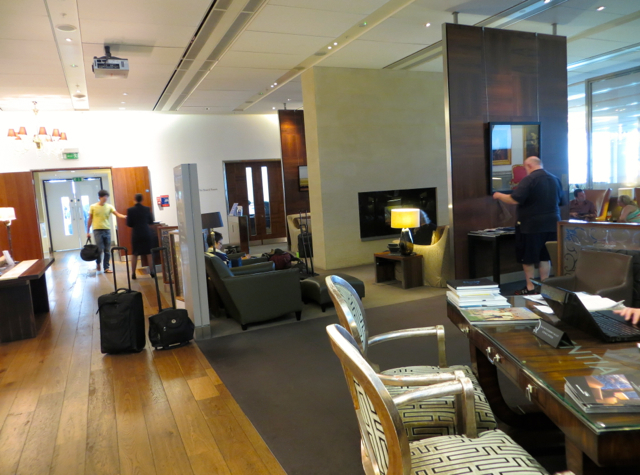 The British Airways Concorde Room at Heathrow Terminal 5 gets mixed if not rather negative reviews, as first class lounges go, so I was curious to see what our experience would be like, prior to flying British Airways First Class back from London Heathrow to New York JFK. We had an uneventful short flight from Paris Charles de Gaulle to London Heathrow, and had a couple hours to experience the Concorde Room. Some months before, I had reserved a private cabana by emailing the British Airways You First email, youfirst@email.ba.com, and received a response back within 48 hours confirming our cabana reservation. I also tried to make an Elemis Spa massage reservation, but was told that these could only be reserved 4 weeks prior to our flight. So about 1 month prior to our flight I again emailed You First and confirmed my 15 minute Elemis Spa massage, specifying the type of massage I wanted to receive. Even before we entered the Concorde Room doors, our boarding passes were checked. No doubt there are quite a few elites that try to gain entry, even though you must be flying British Airways First Class to access the Concorde Room. Once inside, I asked about our Cabana, and was directed to the Quintessentially Concierge Desk, where one of the two associates looked up our reservation and led us to our cabana, Cabana 2. The door slid open to reveal a lounge chair for watching the flat screen TV, a small work desk with bottled water, and a bathroom with sink, toilet and shower with massage jets. 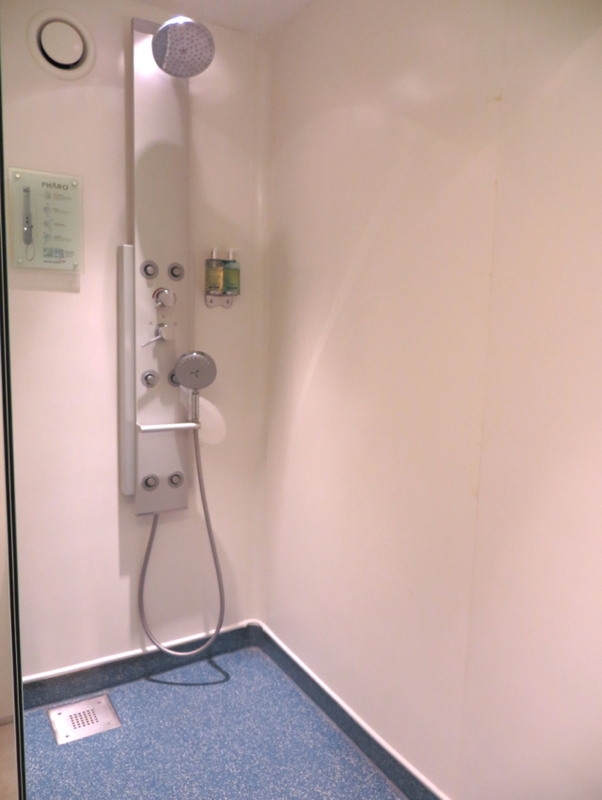 Neither of us needed the shower, but I did like the fact that the cabana included its own bathroom and shower, obviating the need to go to a separate shower room. 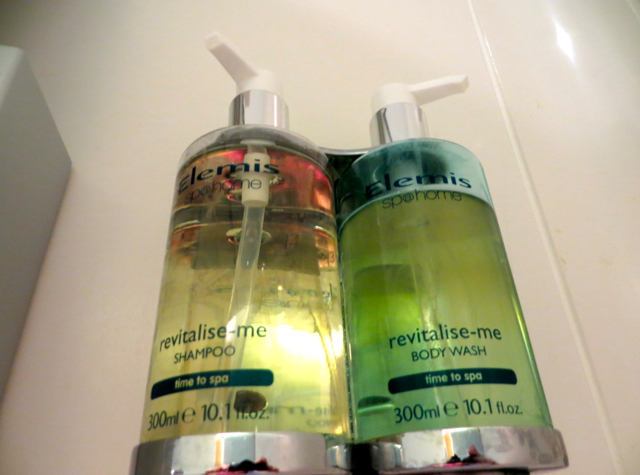 The bath amenities of course were Elemis, and were the “revitalize-me” line, with shampoo and body wash provided. There wasn’t any conditioner, so if that’s something you need, you’ll want to bring your own. On the desk were food and drink menus, as well as a call button, and the concierge explained that food and drinks could be ordered by pressing the call button, which summoned an attendant who would take our food and drinks orders. We were also shown where the power outlets were (no adapter needed) and told that we could call anywhere in the world, a nice perk, even though I didn’t take advantage of it. The munchkin happily ensconced himself on the sofa, and I found a kids’ program for him to watch. I then looked at the food menu, asked the munchkin what he’d like, and pressed the call button. 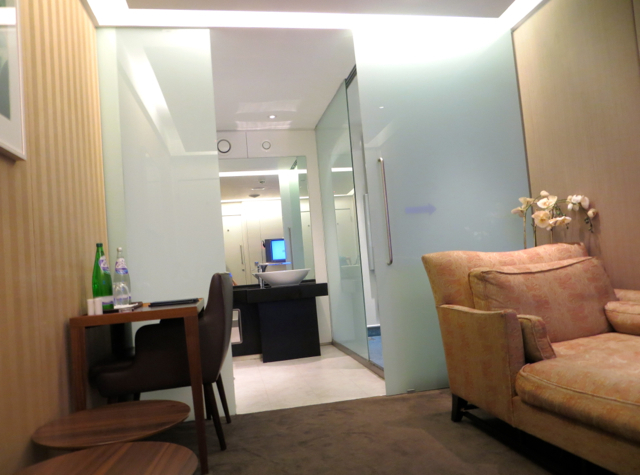 The friendly attendant arrived incredibly quickly, within seconds, and I explained that I wanted to order sea bass for the munchkin and a glass of wine for myself, but that I would order my own meal after my Elemis Spa massage. She said this was no problem, and again, must faster than I expected, within 10 minutes, she delivered my red wine, the Howard Park Leston Shiraz 2009 (which was drinkable but not as good as the reds we drink at home) and the munchkin’s seared sea bass with vegetables. It was very nicely plated, and I was pleasantly surprised at how good this dish was, having tried it for myself. 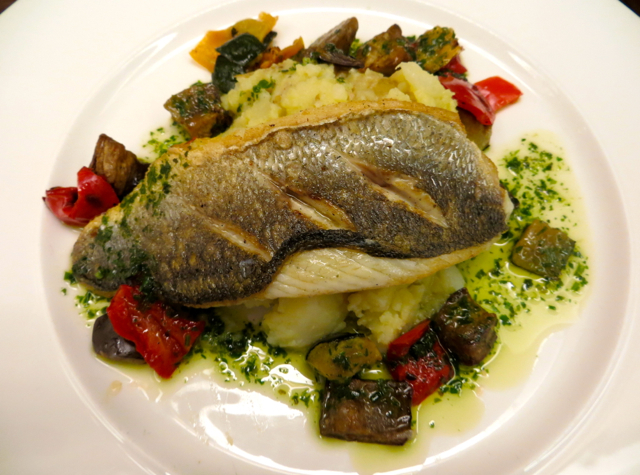 The fish was perfectly cooked, and went well with the bed of mashed potatoes and eggplant and bell peppers sautéed in herbs (although I ended up eating most of the veggies). 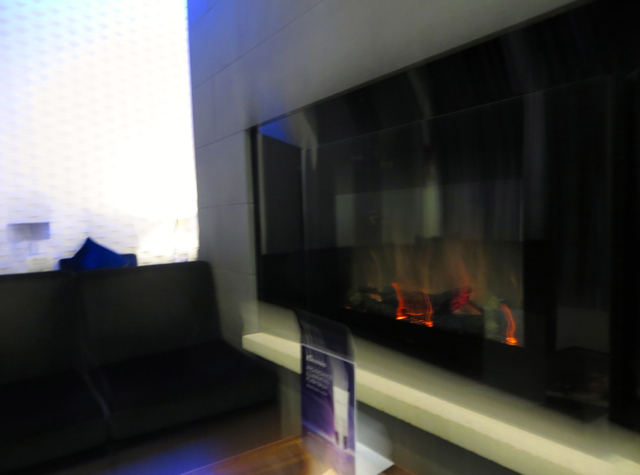 I then went to the Elemis Spa for my massage appointment. I was given a brief questionnaire to fill out, mainly to do with whether I had any medical conditions, then waited a few minutes in the spa lounge. 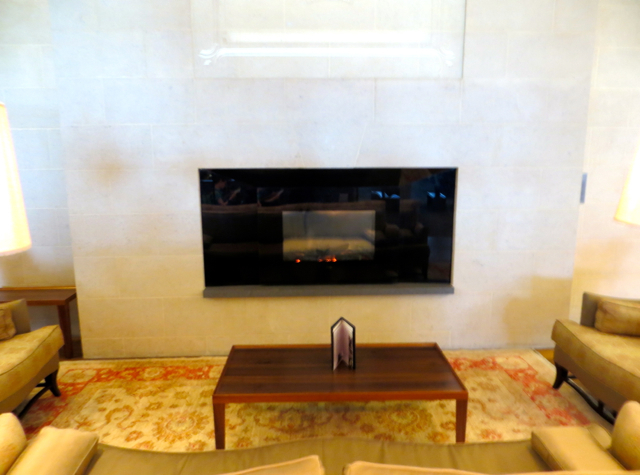 As with the Elemis Spa in the British Airways Arrivals Lounge, there was a gas fireplace, a nice touch. 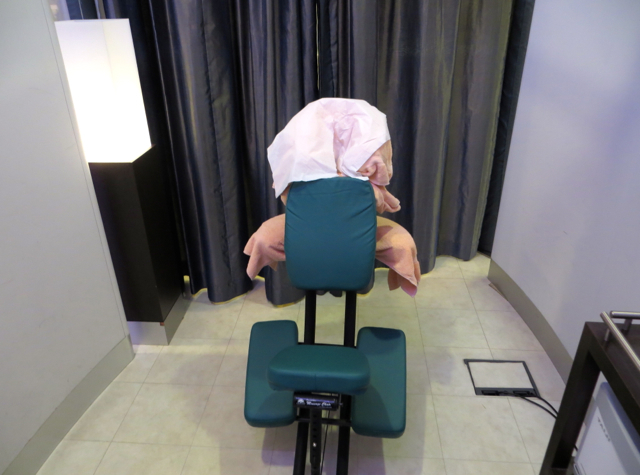 My cheerful therapist arrived shortly, took my questionnaire, and led me to a curtained off “room” with a massage chair, since I had asked for a shoulder and back massage. She gave me the option of aromatherapy, so I chose a citrus scent. Although my therapist was very nice, I found the actual massage disappointing, especially compared to the brief massage I’d had in the Etihad Six Senses Spa in Abu Dhabi. I found the strokes awkwardly done, and not focused on my actual pain points in my neck, shoulder and upper back area. And when I asked the therapist if she could not “massage” my lower back at all, she said something about having to do what that massage prescribes (those weren’t her exact words, but that was the gist). Really? I couldn’t blame her, since I suppose that’s what the Elemis Spa requires, but it certainly doesn’t make me want to visit an Elemis Spa again. I think I actually ended up with some pain in my lower back that wasn’t there before, while my upper back, shoulders and neck weren’t much better after the treatment, in contrast to the very skilled and intuitive treatment I received in the Etihad Six Senses Spa. 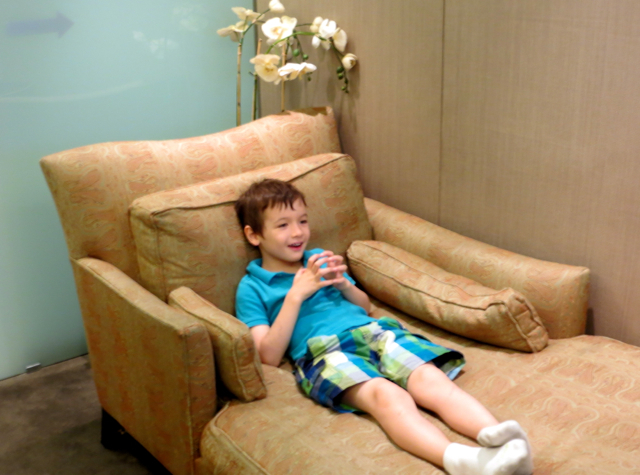 I returned straight away to the cabana, where the munchkin had almost finished his meal and was still delightedly watching a kids’ program. 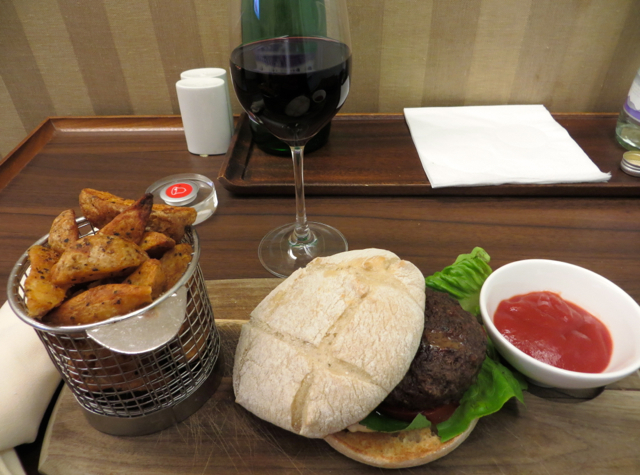 I then ordered my own meal, the “Birchstead 21 day aged BA Burger” with potato wedges. I also ordered a Chocolate Opera Cake with Passion Fruit Sorbet to share with the munchkin for dessert. Well, I can say the burger was one of the worst I’ve ever had—overcooked and chewy, and room temperature. The potato wedges were marginally better, but not great either. I didn’t finish either. 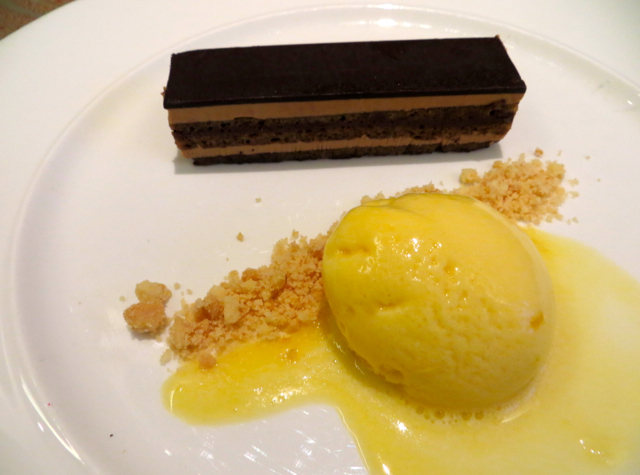 The Chocolate Opera Cake, on the other hand, was great, as was the passion fruit sorbet, even though it was starting to melt as I took the photo. 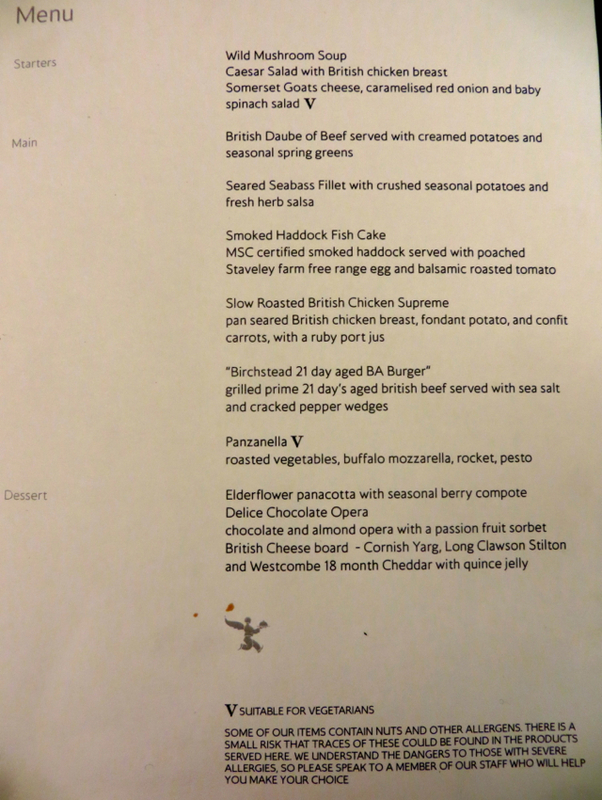 I would have ordered one for each of us if I’d known what a disappointment the burger was going to be, and how good this dessert would be. The Verdict: I had low expectations of the Concorde Room, based on a number of negative reviews I’d read. It’s true that we didn’t really experience the common areas, since we remained in our Cabana except for my Elemis Spa massage. Our cabana was extremely clean and perfectly comfortable given its size, although it would have been nice if the desk were a bit larger. 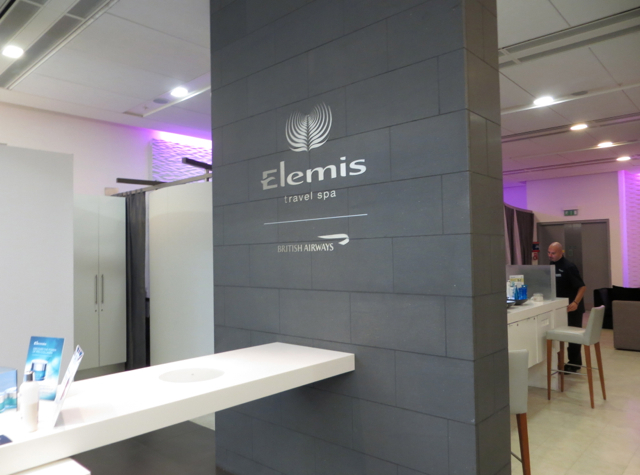 The two big disappointments were the Elemis Spa massage, which in my case felt very amateurish, and the burger, which I definitely do not recommend. We thought the sea bass dish and the dessert, however, were delicious, and the attendant who served our cabana was both extremely prompt and friendly, so I have no complaints about service, based on our experience. If you’ve visited the Concorde Room and used a private cabana there, what was your experience? 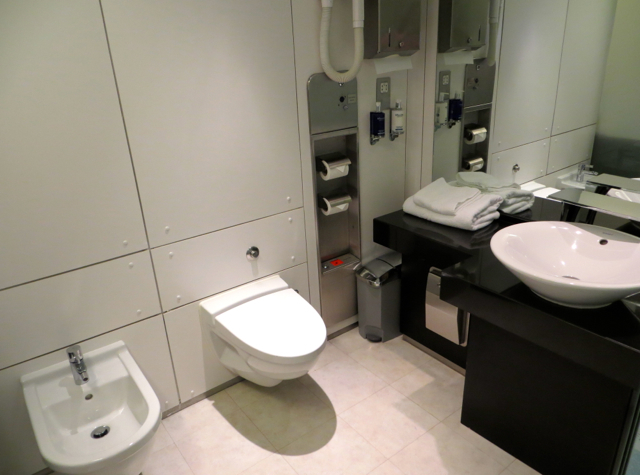 2 Comments on "British Airways Concorde Room and Cabana Heathrow Review"
If there are 2 of you in a cabana, is there space for you both to lie out? I can only see one chair in photos I have seen. Unfortunately there is only one day bed, which is really only suitable for one person. If you both want to lie down and you’re both eligible for a cabana, I’d recommend that you each request your own cabana.